Driven by its long-term vision of building a world-renowned brand, the Saudi company said it is currently exporting its products to 16 countries that include international destinations such as Germany, Canada, Australia, UK, South Korea and Taiwan. “Our continuous growth in terms of sales, production and acquisition of new markets is a tangible proof of our success,” said Mazen Al Hammad, CEO and shareholder of Future Ceramics. “I used to buy tiles from Germany, now we export to Germany,” Al Hammad added with pride. Spaggiari ... “ready for all architectural needs”. 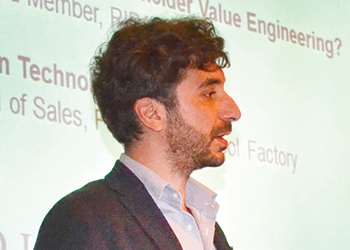 A key reason for its success in the regional and global markets is the company’s “obsession for quality”, which has resulted in products that match those produced in Europe, according to Makram Al Andalosi, Future Ceramics’ sales director. “We often have to clarify to new customers that our tiles are actually produced locally when asked if they are from Italy or Spain,” he said. Its short-term sales strategy is to create a strong network in the GCC countries, with special attention to the UAE, Qatar and Saudi Arabia. In Saudi Arabia, Future Ceramics will open two new showrooms in Dammam next month, boosting its current network which includes flagship stores in Riyadh, Jeddah and Khamis Mushayit. Demand for its products has been such that the company has already initiated the expansion of its factory in Dammam. This factory employs the latest Italian technology, the best raw materials and unique designs to produce Future Ceramics’ wide range of products. Future Ceramics’ stand at Middle East Stone (top), where its new tiles with special thickness were dis-played. The company’s culture of design is another distinctive trait of its development strategy in a bid to fully respond to any architectural requirement, said Francesco Spaggiari, the company’s Italian art director. “Our research aims to create collections that combine Italian elegance with the charm of the Arab culture,” he added. Future Ceramics’ current portfolio comprises 27 ceramic and 32 porcelain collections, all of which are available in a wide variety of colours and sizes, supported by a production capacity of 36,000 sq m per day. The company has recently created a free App for iPad called Future Ceramics, which facilitates matching of colours and sizes. 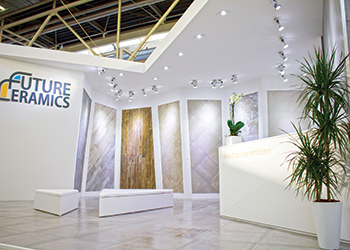 Future Ceramics has also recently presented during the Middle East Stone Exhibition at the Dubai World Trade Centre in Dubai, UAE, a 20-mm-thick porcelain stoneware tile, arousing great interest among visitors. Five new collections, inspired by nature and conceived in this special thickness (twice that of a traditional tile), will be the core of the Future Ceramics’ showcase at Cersaie, a key international event for the ceramic sectors, which will be held next month (September 28 to October 2) in Bologna, Italy. The five collections, known as Outdoor20, consist of single-piece porcelain stoneware slabs having a thickness of 20 mm and 60 by 60 mm in size, with an anti-slip surface finish. 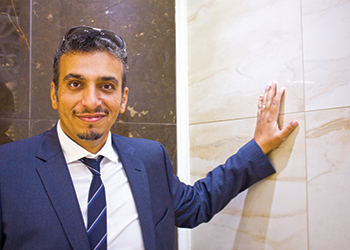 “This porcelain stoneware’s amazing resistance to loads opens up new avenues in terms of areas of applications and application techniques,” Al Hammad said. Durable, anti-slip, easy to clean, resistant to loads and salts, eco-sustainable and with a water absorption close to zero, this product combines the advantages of traditional porcelain with those of natural stone, while eliminating the drawbacks, he added. Outdoor20 is described as being the perfect solution for gardens, pathways, garages, high-traffic floors such as in malls and airports and also for external cladding. Products on display at Cersaie 2014. It can be applied using five techniques. 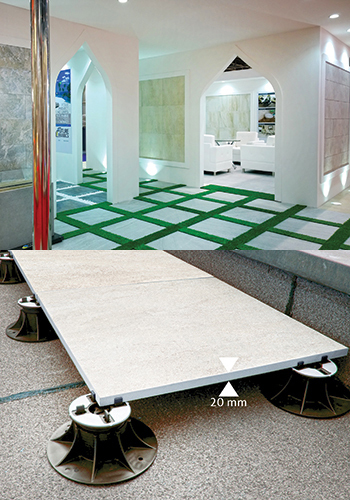 The slabs can be directly installed onto gravel or sand without the use of grouts, saving time during the installation; on grass surfaces; on a raised flooring by placing the slab on supports, thus providing underfloor space to house electrical cables and irrigation pipes and at the same time facilitate air flow; and as a traditional adhesive installation, where its tremendous resistance to loads makes it an ideal solution for car-parking, access ramp and high traffic floors. In addition, it can also be utilised for façade cladding, employing the mechanical system used for natural stone. Future Ceramics has recently supplied many important projects in Saudi Arabia such as King Faisal University in Al Ahsa, King Abdullah bin Abdulaziz University in Riyadh, King Saud University in Khamis Mushayit, Royal Commission housing schemes in Jubail and Yanbu, the South Border facilities in Jeddah (Saudi Binladin Group), the Jeddah Gate (Emaar Middle East), and many Aramco projects.